Angie’s List has one, Service Magic has one, even the online YellowPages has one – it’s a rating system representing consumer confidence. From low to high, how does this company treat their clients? “In today’s tight economic times, these ratings not only spotlight the honest and ethical companies customers look for, but the ratings components also assist companies to see where their operations may be improved.” Says Steve J. Bernas, president and CEO of the BBB of Chicago and Northern Illinois. The new ratings take into account 17 weighted factors, using objective information and actual incidences concerning the business. For more information about the BBB’s new rating system and specific rating factors, visit www.bbb.org. There are many benefits to remodeling your home; at the top of the list is pride of homeownership. But for so many of us, we have to remodel our home in stages – we don’t have unlimited funds to changes everything at once. If you do not have an urgent need to remodel a particular space over another (ie. leaking roof, structural damage, etc. ), how do you decide what takes priority? If you are looking for tax deductions, then you may want to consider these remodeling projects first. Starting this fall, as part of the economic stimulus plan under the American Recovery and Reinvestment Act, the “Cash for Clunkers” extends to Appliances. Basically, purchase a new energy efficient appliance and get a tax credit of $200. Just like the “Cash for Clunker Automobiles” there is a set dollar amount set aside for this program and once the money is gone, the program is over. Appliance companies should have available to you the list of products they carry that qualify. You may have to surrender your existing appliance in order to receive the benefit. Install a solar panel to provide your home energy and not only will you see a substantial tax credit and your electric usage drop, but you may even be able to sell energy back to the electric company. For those of us who are less adventurous – upgrade your boiler, heater, furnace, air conditioner, windows, roof, or insulation and you will not only see savings on your gas and electric bills. The credit covers 30% of the energy saving improvements, capping at $1,500 for 2009 and 2010. The credit will no longer be available after 2010. When you complete your tax return be sure to include Form 5695. The IRS website gives more information. Provides a tax deduction of up to $2,000 per family, or a tax credit of $500, for the purchase of certain materials and home furnishings. If you use green products that meet LEED (or other recognized standards) the tax deduction would actually double. Purchases excluded from the HIRE Act are major appliances, housewares and electronics. Canada has had a similar program in place since January and has seen a positive effect in stimulating the home improvement industry with one in three Canadians planning to take advantage of the program. (Home Channel News, 9/21/09, pg 35) For more information visit the HIRE Act of 2009. Like the auto industry, the home improvement industry is huge. This is a service industry rooted in American workers and the US economy. In the past couple years over 270,000 Americans have lost their jobs in the building products and home furnishings sector, and a loss of over 290,000 jobs are expected for 2009. Keeping Americans working is not only a short term tax relief for homeowners, but it is a way to help us all weather the long term effects of this stormy economic climate. Whatever you do, when you remodel your home, keep documents of everything. Think of each contract not as a receipt of purchase but a proof of investment. Give a copy of what you did for the year to your accountant. When you sell your home, have these documents on hand, you may be able to deduct these expenses from any capital gains. * Consult your accountant to see what tax benefits you qualify for before you start a remodeling project. Written by Imperial Kitchens and Baths Designer, Stephanie Bullwinkel, CBD. Many of us are strapped for cash, but we just can’t live with our bathrooms they way they are. So here are a few ways that you can update your bathroom now and buy yourself a little more time before you remodel. 1. Fresh Paint. Giving the walls and ceiling a fresh coat of paint is fast, cheap and virtually mess free. A gloss finish works well in bathrooms, but beware if you have any defects in your walls the gloss will accentuate the negative. Matte finishes have a tendency to mildew and show humidity streaks; however, several paint manufacturers have been working to solve this concern. Eggshell is a nice middle ground. It will give you a soft sheen that will not readily absorb moisture and will not draw so much attention to flaws in your walls. 2. Update and replace lighting fixtures. If your bathroom lighting is not flattering your face, it is doing you no favors. Applying makeup, shaving, etc. in poor light will not give you the look you are going for. When shopping for a new fixture remember that is the quality and amount of light that is most important, style is second… how many people are going to see your face today vs. how many people are going to see your bathroom? 3. Replace outlets if the present outlets are not GFCI. This is one of the most important safety issues in a house. Electricity and water should never mix. A ground fault circuit interrupter, commonly known as GFCI, will protect you if your hairdryer, curling iron, etc. fall into a sink full of water. A GFCI outlet is one that has two little buttons in the center of the face. GFCI outlets should be around anywhere you have water. 4. New towels, rugs, accessories. Are your towels miss-matched? Is your bathmat tired? Do the accessories around the room have a pitted or peeling finish? Accessories are generally easy to change with only the need of a screwdriver or Allen wrench. Colors and patterns of towels and bath mats can be the same or mix-and-matched as sets. Fresh towels not only look good but feel good too. To keep you towels at their best, do not wash or dry with fabric softener… the waxy buildup on the material will make them less absorbent. 5. Reglaze the tub. Some tubs cannot be reglazed, but if your tub is looking shabby it is an option worth investigating. Sometimes reglazing can add ten more years to the life of your bathtub. 6. Clean up old caulk and grout. Nothing contributes to the gross-out factor in bathrooms like moldy caulk and grout. More than just aesthetics, mold is unhealthy. Of course in humid areas, like bathrooms, it is a constant battle. Cut out old caulk, clean out the area, LET DRY, then recaulk. Clean grout with vinegar on a regular basis, using a soft small brush in troublesome areas (be careful not to scrub out the grout). Bleach applied with a cotton applicator once or twice a year can be beneficial as well, as long as your grout is color safe (test a small inconspicuous if you are concerned). If all else fails, you can regrout. If you don’t want to try your hand at this project, there are services that do this. Once your grout is clean, seal it with a grout sealer regularly to keep it looking good with minimal effort. 7. Reface the vanity cabinets. A general rule of thumb is that the larger the cabinet is, the more expensive it is going to be to replace. It you have a bathroom with a large vanity area, you may want to consider refacing the vanity cabinet, the cost can be half as much as replacing. Refacing involves replacing the cabinet doors and drawer fronts and then covering the cabinet box in a material that matches the new doors. While the interior of the cabinet looks the same, the exterior will give the whole room an updated look. 8. New solid-surface countertops. The countertop marketplace is flooded with new materials; it can be hard to decipher which material will work best. Laminate and cultured marble is the most inexpensive option, but are not the most durable. Solid-surface materials like Corian and Meganite are renewable, can have the sink bowl fused into the top, are easy to clean and offer a 10-year warrantee. You will pay a little more for these products up front, but the long-term investment will pay for itself over and over again. 9. New faucets. You can buy an inexpensive faucet as long as you realize that you are getting what you are paying for and may have to replace it again in the next few years. If you are looking for a long-term investment you will be looking for ceramic disc-valves, this will guarantee that you are never fiddling with a drippy faucet. You will also want a PVD finish; this insures that your faucet finish will not change color, peel or pit over time. Again, you will pay more for these faucets up front, but over time they end up paying for themselves. 10. Hang framed artwork. You can get “canned” art from almost any hobby or furniture store. But a trip to your community art galley can open your eyes to some local staving artists and you may pay about the same amount for an original as you will for a mass produced print. If you are having artwork framed tell the framer that the piece is going in a bathroom and the amount of light the room gets so they will use the correct materials for protecting your art. A frame boosts the importance of any image, if it is done right, even a child’s handprint can claim Picasso appeal. Written by Imperial Kitchens and Baths, Inc. designer, Stephanie Bullwinkel, CBD. I see a lot of blogs about remodeling and what is starting to come to mind are the TV commercials where someone stays at a particular hotel and that immediately makes them an expert in everything. Blogging is a wonderful way to spread information quickly and easily, but there are no checks and balances as to who is authoring them. Just because you write a blog does not make you an expert. So, why would someone write about something they know nothing about? Google has a product called AdWords. If you want to advertise your product or service online, AdWords is an easy way to do it. Not only can you get top listing on Google Search engine, but you can have your ads placed on other websites that are registered with Google. If you are a blogger you can set yourself up with Google to have advertising placed on your blog. Every time someone clicks on the ads listed, the blogger makes some money. So to make money, the blogger writes articles on hot topics hoping to draw an audience – not to educate you and help you, but to hopeful get you to click an ad. The downside is that many of these blogs are not only poorly written, but they give bad, and potentially damaging advice. This is very much the case in remodeling, where DIY projects are all the rage. Next time you are reading a blog that tells you how to do something, research the author. Are they an expert in their field or are they just a billboard. Most of the time these authors won’t even list their name. If they are listed, what else has they written about? If the topics don’t coincide, chances are they don’t know what they are talking about. If you are looking to remodel any part of your home, get expert advise from someone in the field. How Much Does a Remodel Cost? About once to twice a week I find a blog asking “How much?” How much is a bathroom remodel? How much is a kitchen remodel? How much to finish my basement? And this is best answered with… how much is a car? It depends. What are you trying to achieve? What products do you like and in what finishes? What are you looking for in a designer or contractor? People who are practicing their craft are often less expensive upfront than the seasoned professional. Unlike the car industry, the remodeling industry doesn’t have factory set standards and internal quality control. There is no government instituted lemon law for a botched remodel. It is our hope that companies who are affiliated with professional groups like NARI and NKBA are playing by the “best practices” standards and their pricing should reflect that. When you purchase a $10,000 car it is an economy vehicle, $30,000 is a mid range and anything above $60,000 is luxury. My point is this; I could say a modest bathroom remodel is about $30,000. But your bathroom is 5×7, $30,000 would be a bit luxurious… while $30,000 in a 12×20 master suite would not go far. And to make matters even worse, your location also determines your investment figure. People who live in New York city are going to pay a lot more for a kitchen remodel than someone who lives in Sandwich, IL. Labor is more expensive in New York because the cost of living is higher. Not to mention working in a high rise is more expensive than working in a home. Just unloading tools and materials can take half a day when working in a high rise. So, for a true idea on how much to expect your remodel to cost you, stop blogging. Most of the people who will answer you don’t have a clue – even if they are professional remodelers, they don’t know your space. Call a few local contractors. Give them the same detailed description of your space and what you would like to do with it. A veteran in this business will be able to give you ball park figure (ie. “Expect your bathroom to start at about $15,000.”) For a more definite estimate, have them out to your home. The Better Business Bureau recommends starting out with three bids on your project. But you say that you don’t want to be completely in the dark before you pick up the phone. You would rather suffer sticker shock in private. Then the best place for a jumping off point is Remodeling Magazine. Every November they put out an issue called “Cost vs. Value.” This annual survey not only shows you the approximate cost of a particular remodel in your region of the US, but it will also tell you what kind of return you could see if you were to sell your home after the remodel. You can find this information on their website: http://www.remodeling.hw.net/remodeling-market-data/remodeling-cost-vs-value-report-2008-09.aspx . If you are improving your home with the intention to sell, remember that low-cost, low-maintenance improvements are where you are going to see the greatest return for your money. However, most of us remodel our abodes for ourselves; it is about investing in our happiness at home. You need a bath – you just want to soak your aching _______, relax your ______ and unwind from the day. If you are sore, getting in and out of a bath tub can be daunting. But if you are in any way disabled, it can be impossible. ADA bathrooms are typically designed for wheelchair accessibility. Being able to get in and out of a tub is not a requirement and often during a bathroom remodel for people with special needs, the tub is replaced with a larger shower void of thresholds and shower doors. Large showers litter nursing homes, which makes life easier on both clients and caregivers in the daily task of hygiene. But the physiological benefits of a long soak are lost. It is a shame that many Americans who need hydrotherapy the most, can’t use it because of their physical limitations. 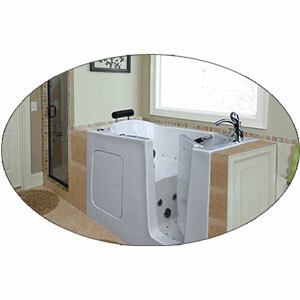 A few tub manufacturers have developed a soaking tub with a seat and door system that allows accessability to people who cannot get into a conventional tub. We perform about 1-2 remodels a year for people who have special needs and we recently learned that one of our trusted US manufacturers is now offering walk-in “Experience” tubs. Whirlpool, bubblers, chromatherapy, aromatherapy and the like is now available for people who need it the most, with limited to no assisance needed from a caregiver. We are very excited about this advent in technology. Natural light in our home is usually something we desire. In fact, it is a major selling point in real estate. However, having a window in the shower area is not so favorable and can be down right annoying. It’s not unusual to walk into a older home and find that the tub/shower has two shower curtains – one to keep waterout of the room and one to cover the ackwardly placed window. There are better ways to address this common problem. Bathrooms need ventilation and before vent fans were an option, there were operable windows. Older homes often used the same windows in the bath area as they used in the rest of the home. This poses two problems, lack of privacy and wood rot from excessive moisture. The quick and cheep way to tackle lack of privacy is to buy contact sheets for glass. This material will adhere to glass and create a semi-opaque appearance. It comes in a number of different textures like frosted and rain; it is available at many hardware stores and can be found online and in specialty catalogues. The more expensive option is replace the window. New vinyl windows can be fitted with textured glass. New windows will also cut down on drafts and heat loss. Vinyl windows are the best replacement window for the shower area. Metal windows can rust, while wood windows rot. Once you have decided to replace a window, the next step is to determine the window moulding. Windows don’t need to be outfitted with moulding. Tile or other shower wall material can be brought up right to the window frame. But in many older homes, sometimes we want to maintain the original look to the home. A solid surface material, like Corian, can be custom fabricated to look like the original trim to the house. This works exceptionally well when the trim in the house is painted white (wood grains and stain finishes are impossible to match). The new moulding is easy to care for and is impervious to water, so mold and rot are no longer an issue. Now is the time to replace your bathroom window if you find that ice damns build up inside the window during the winter months.